Machine Gun Kelly is an American rapper and actor, from Cleveland, Ohio. He embarked on a musical career as a teenager, and released his first mix-tape back in 2006. Today, he is wildly successful in the industry, and is one of the most looked up to rappers in the game. As of 2019, Machine Gun Kelly’s net worth is roughly $8 million. MGK has worked with all kinds of artists over the years, including the likes of Wiz Khalifa, Young Jeezy, and Meek Mill. MGK was born Colson Baker, on the 22nd April, 1990, in Houston. Kelly and his family would move locations very often, and even lived abroad in countries like Egypt and Germany. In the States, they lived in Chicago, Denver, and Cleveland. He settled in Denver, along with his father, after his mother had left home, and the pair moved in with MGK’s aunt. Kelly attended Hamilton Middle School, where he was bullied due to his father’s battles with depression. He started rapping in the 6th grade, and has stated that the three initial rappers who inspired him to join hip hop as a child were Ludacris, Eminem and DMX. Life at home for Machine Gun Kelly was unstable. He would regularly fight with his father, and when he attended Denver’s Thomas Jefferson High School, his father moved to Kuwait to work, and left him behind to live in his aunt’s basement. Eventually, MGK and his father moved to Cleveland, where he attended Shaker Heights High School. He convinced a local t-shirt shop owner to become his manager, as the shop owner would double as a MC manager. 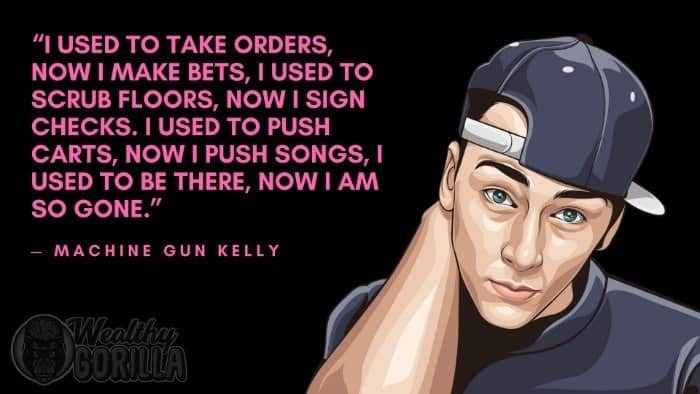 Kelly was given his stage name Machine Gun Kelly by his fans, due to his rapid fire delivery. His very first mix-tape was titled ‘Stamp of Approval’, and helped to make a dent in the industry and get his name out. Even whilst producing mix-tapes and gaining a fan base, MGK was still struggling through hard times. He was on the verge of getting evicted, and had to work at Chipotle just to pay his bills. 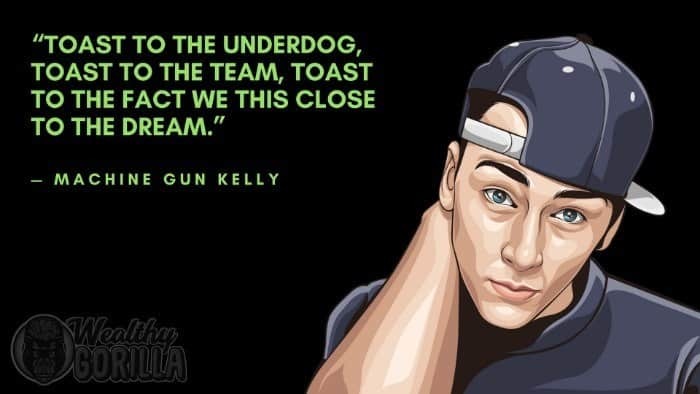 A few years later, the Lace Up Mix-tape was released, throughout which MGK showed a lot of love for Cleveland. For that fact, he quickly gained popularity in his city. Pretty soon after, he began recording full studio albums, and rose to stardom. How much is MGK worth? As of 2019, Machine Gun Kelly’s net worth is estimated to be $8 million. View our larger collection of the best Machine Gun Kelly quotes! Machine Gun Kelly spits real lyrics; these are lyrics that all his fans connect and resonate with. 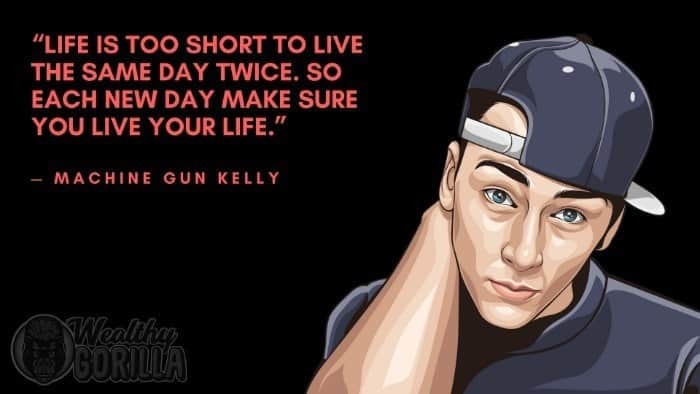 Which is one of the major reasons why he’s become so successful in hip hop. As of 2019, Machine Gun Kelly’s net worth is $8 million. 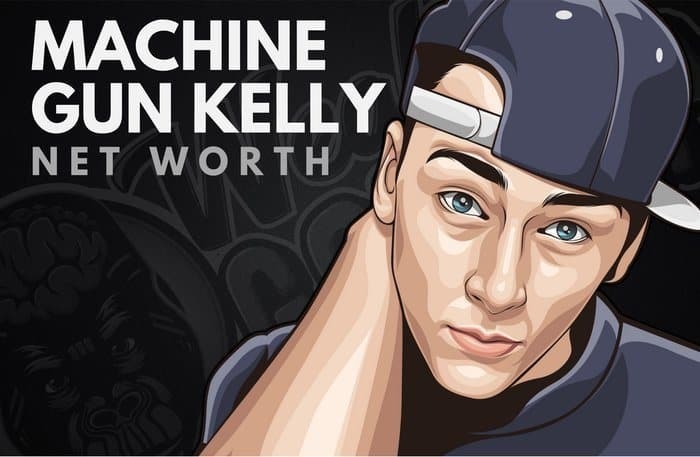 What do you think about Machine Gun Kelly’s net worth? Leave a comment below.